Place salmon in large plastic bag and add marinade. Spray baking pan with nonstick cooking spray. Remove salmon from bag and place skin side down. 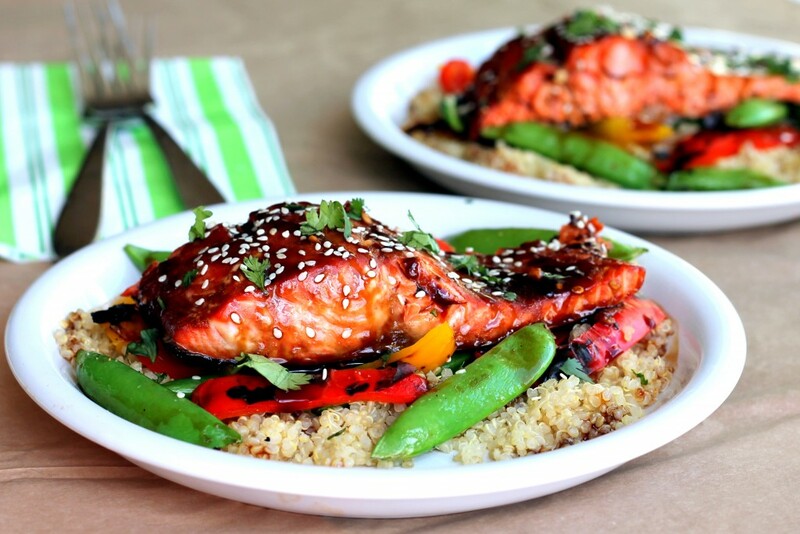 While salmon is cooking, prepare quinoa stir-fry. Bring 1½ cups of water with garlic salt to a boil in a medium saucepan. Reduce heat to low, add quinoa and cover; simmering until all liquid is absorbed. Remove from heat and let stand another 5-10 minutes. Fluff the quinoa with a fork and set aside. While quinoa is cooking, heat 1 tablespoon of olive oil in large skillet over medium-high heat. Add minced garlic, ginger, and sliced bell peppers; cook for 1-2 minutes. Add sugar snap peas and cook for 2 minutes more. Add quinoa to vegetables, and then add salt and pepper to taste and red pepper. Spoon quinoa stir-fry evenly into 4 bowls or plates. Immediately place salmon on top. Sprinkle over with sesame seeds and cilantro. Glaze with extra teriyaki sauce. Salmon is very sensitive and can dry out easily if overcooked, so make sure you watch your fish. For every inch of thickness of the salmon, generally it takes about 10 minutes to cook. Usually salmon fillets are about 1½ inches thick. Preparing quinoa ahead of time makes this dish even easier; simply reheat quinoa and add to stir fried veggies. You can combine this excellent recipe with some other of our collection.